Age – Applicant must be at least 18 years old at the time of filing for naturalization. Lawful Admission as a Permanent Resident – Applicant must have been admitted as a lawful permanent resident (green card) for at least 3 years. 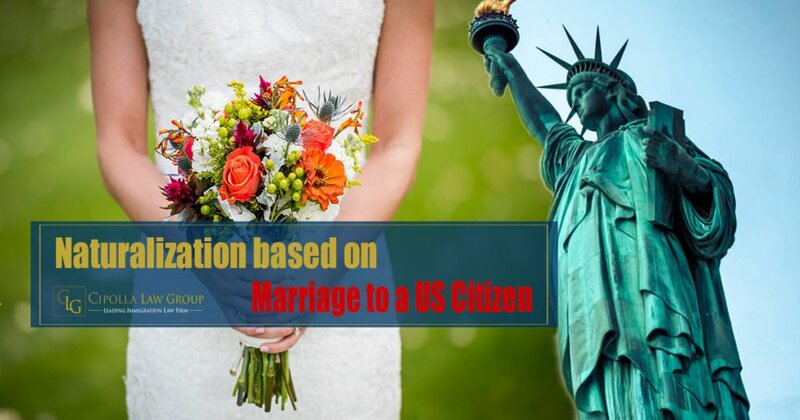 *Marriage to U.S. Citizen Spouse – Applicant must continue to be the spouse of the U.S. citizen up until the administration of the Oath of Allegiance. *Marital Union – Applicant must be living in marital union with the U.S. citizen spouse for at least 3 years immediately preceding the date of filing the application (the U.S. citizen spouse must have been a U.S. citizen for those 3 years). Continuous Residence – Applicant must have continuously resided in the U.S. as a lawful permanent resident for at least 3 years immediately preceding the date of filing the application and up to the time of admission to citizenship. Physical Presence – Applicant must be physically present in the United States for at least 18 months out of the 3 years immediately preceding the date of filing the application. Jurisdiction – Applicant must have lived within the state or USCIS district with jurisdiction over the applicant’s place of residence for at least 3 months prior to the date of filing the application. Good Moral Character – Applicant has the burden to establish good moral character for 3 years prior to filing for naturalization, and during the period leading up to the administration of the Oath of Allegiance. USCIS has discretion to look beyond this statutory period. Attachment to Constitutional Principles – Applicant must establish that they are attached to the principles of the U.S. Constitution and well-disposed to the good order and happiness of the US. English Language Proficiency – Applicant must demonstrate an understanding of the English language, including the ability to read, write and speak words in ordinary usage in the English language. Knowledge of Civics and History – Applicant must have knowledge and an understanding of U.S. history and government. *Exceptions apply. See details below. When can you file a naturalization based on marriage with a U.S. citizen? The spouse of a U.S. citizen residing in the U.S. may also naturalize under the general naturalization provisions for applicants who have been lawful permanent residents for at least 5 years. The spouse of a member of the U.S. armed forces may be eligible to naturalize abroad. an approved waiver of the joint filing requirement for petitions to remove conditions for conditional LPRs, if the marriage was entered into in good faith and the spouse was subjected to battering or extreme cruelty by the U.S. citizen spouse. After an N-400 application is filed with USCIS, applicant’s biometrics will be taken. A naturalization interview will then be scheduled. For the past 2 years, USCIS has been experiencing extreme backlogs with N-400 cases. It’s taking around a year for N-400 cases to be adjudicated, depending on the USCIS district office. Once an interview is scheduled, applicant must attend the interview, where he/she will be interviewed about their application and background. During the interview, applicant must also pass the civic and English exams. If the N-400 is approved, the applicant must go to the Naturalization Ceremony where he/she will return their Permanent Resident Card and take the Oath of Allegiance. After taking the Oath of Allegiance, the applicant will receive their Certificate of Naturalization. The Certificate of Naturalization is evidence of their U.S. citizenship. If you have any questions about your eligibility, especially if you are divorced or no longer married to your US spouse or have been a victim of domestic violence, please contact Cipolla Law Group. If retained for your naturalization case, our Chicago Immigration Lawyers will prepare the case, hold a mock interview to prepare you for the interview, and attend the interview with you if it is scheduled at the USCIS Chicago Field Office. Our immigration law firm is conveniently located at downtown Chicago by S Michigan and Van Buran. Contact us today and find out how we can help you to naturalize to become a US citizen.